What does a sledge and a strategy have in common? 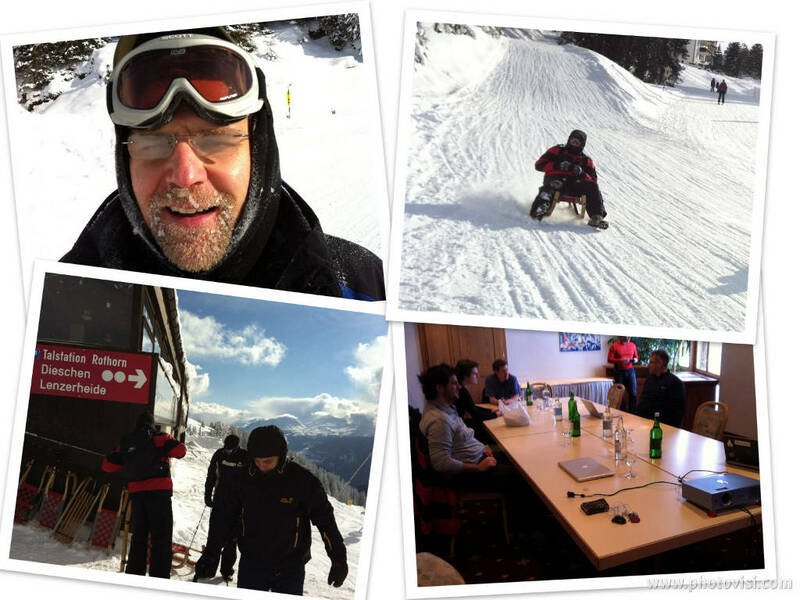 Simple, the ICCLab Retreat and Sledging Event which took place in Lenzerheide – Switzerland last weekend. The event started 06:45 in Winterthur and yes, the team demonstrated impressively that this time is also at Saturdays no problem. When we arrived at the coach, there was the first problem to solve with the coach-driver that was: How to divided an IT-scientist from his notebook? Because all sort of bags were not allowed in the coach and beside that, also no drinks and food. But of course, we managed it and realized that not everything can be as elastic and flexible as a Cloud. Once arrived at the Lenzerheide, the hotel Valbella-Inn welcomed us warmly and the booked conference room was well prepared by the hotel. After the introduction of the retreat meeting by Thomas Michael Bohnert and the review of the year 2012, we also discussed where the ICCLab should go in 2013. In addition to the objectives of the individual themes and initiatives, all members have the same idea about where should be the ICCLab end 2013th. The ICCLab should be seen by public as a competence center for cloud computing and all the related technologies to it. Once the meeting was over, the sledging competition started with Andy Edmonds as referee. As it is in Ski-Alpine, we had a first and a second run and after the latter the winner was clear, Christof Marti has won both runs. After the sledging, we enjoyed a very typically Swiss drink available in most Ski resorts in Graubünden and is called the “Schümlipflümli”. The Retreat and Sledging Event was a success and the whole team is looking forward to the next years sledging competition because one or the other wants to have a revenge versus the current ICCLab sledging master.